Entire Run of Superman Animated Coming in one Package! In the mid-90's, the Warner Bros. Animated department put their much-loved Batman series on ice and turned to Metropolis as their next port of call. 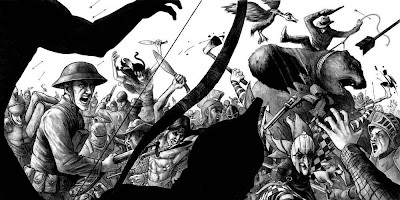 The cartoon became hugely influential on the comics, which had become mired in the John Byrne/ Marv Wolfman relaunch, quickly missing the forest for the trees. I believe at the time of the cartoon's debut, we had Mullet-Superman who the writers and artists had some kind of funny ideas about what made a Clark Kent for the 1990's. In many ways, its shocking that this era of Superman didn't make me go running from the character altogether. The cartoon (in addition to my pre-Mullet-tude Superman* reading, the movies, and a few other sources) had as much of an influence on my descent into Super-fandom as anything else. Bruce Timm and crew created an interesting mix of modern-Super elements and classic. 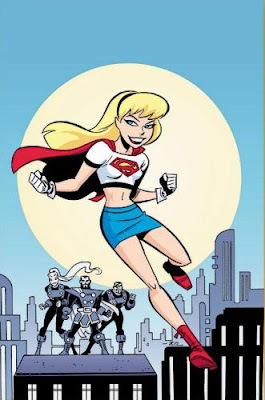 Many versions of the characters they created eventually became the standards in the comics (including a redesign of Supergirl which found its way into the comics, and led to the current design). A personal favorite of mine was the handling of Toyman, who they made from a sort of obnoxious mad scientist-type into a creepy little psycho in a plastic doll mask. You can probably credit voice director Andrea Romano for the insanely good voice acting. Many Superfans consider the voice actors for the program as important to the Superman media world as their movie counter-parts. No doubt Tim Daly was a great mild-mannered Kent and earnest Superman, but the rest were of no small note. While its always sad not to be able actually see Dana Delany, her Lois is now iconic, just as Clancy Brown's baritone Lex Luthor exemplified arrogance and malevolence. I was also quite fond of David Kaufman as Jimmy Olsen, Corey Burton as Brainiac, Malcolm McDowell as Metallo... Anyway, this will get boring very quickly. Bruce Timm imported the same blocky character design he had developed in the later seasons of Batman: The Animated Series. This worked terrifically well during cross-overs with Batman, btw (I highly recommend the "World's Finest" 3-episode run. Just great stuff.). Metropolis was imagined as an art-deco city of tomorrow, with freeways running between the skyscrapers and the ground often not in view, perhaps in homage to Fritz Lang's film "Metropolis". The episodes tended to introduce villains as new and unique challenges for Superman, with recurring villain Lex Luthor at the center of Superman's world. 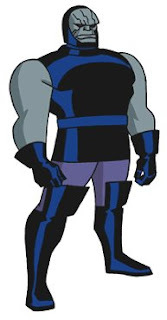 However, DC Animated also brought The New Gods to television with the entire cast of cult characters and in a bit of inspired stunt casting, Ed Asner as Granny Goodness (and Michael Ironside as "Darkseid", but that's kind of a "well, who else are you going to cast as Darkseid?" option). 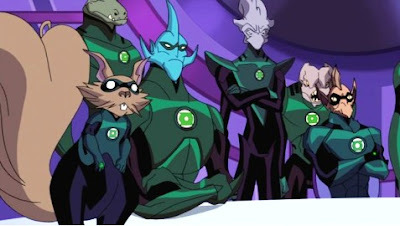 But the series also introduced Superman's rogues gallery, a group a lot less well-known than Batman's crew of villains. Toyman, The Parasite, Brainiac, Bizarro, Metallo, Mxyzptlk (perfectly cast with Gilbert Gottfried), Jax-Ur, etc... but also created at least one new villain with "Livewire", who has since made her way into the comics. The show also introduced other DC heroes, including Steel, Kyle Rayner Green Lantern, The Flash, Aquaman and more. 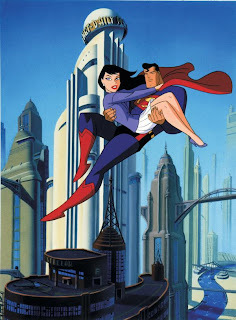 Soon, you will be able to order/ rent/ etc... the Superman Animated series in its entirety. Here. For those of you with Lil' Leaguers in tow, this might be a fine investment. While Superman doesn't have the pop-culture cache of Spider-Man or Batman, I think the cartoon series makes it pretty clear why Superman is a great character, and not the barrel chested cookie cutter superhero that most people assume. What's often forgotten is that the series actually had a pretty neat line of toys, that found different gadgets, etc... with which to equip the Man of Steel. I have a small collection of the toys, myself, Bizarro being a personal favorite. 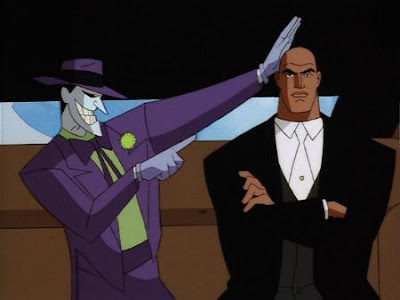 The series didn't last very long (less than 60 episodes, I think), and folded into the Justice League and Justice League Unlimited cartoons, both of which continued the same narrative started in Batman: The Animated series. *I should point out that the hair wasn't so much the issue as the sort of dull, working-stiff take on Superman that seemed to permeate the post-Death of Superman era. Superman more or less just felt like a stand-in for any generic superhero, only surrounded by the trappings of the Super-verse. John Hughes wrote "National Lampoon's Vacation". For that reason alone, the man deserves your respect. You may discuss your love of "The Breakfast Club" (which I wrote about here not all that long ago), but I was more of a fan of the "Vacation" movies, "Planes, Trains and Automobiles", and especially "Ferris Bueller's Day Off". That doesn't mean I don't like the more Ringwald-centric films. But you have to have your favorites. Like everyone else, I was shocked to hear the man who was behind so many of the culture-touchstone movies of my generation has passed at 59. There's not much else to be said that hasn't yet been said. The man made a lot of movies, many of them good, many of them entertaining when he moved into family faire (I kind of liked his '101 Dalmatians' live action movie. So sue me. I like puppies.). And that's not a bad legacy. Thanks to Nathan C. for the alert and Variety article. I'm behind the government looking to offer an insurance option. And, honestly, I am more than okay with it if we wind up with socialized medicine. I know that's not fashionable, or what you're supposed to say as a "good American", or whatever, but thanks to the day-to-day life that Jamie and I live, I simply believe there's too much at stake. At age 17, Jamie was diagnosed with something called Focal Segmental Glomerulosclerosis (FSGS). The cause is unknown. It strikes all kinds of people, and it shuts down your kidneys completely. Were it the 1950's when Jamie was diagnosed, she would have been dead long ago. She's had two transplants. She's been on dialysis twice for a total of about 8 years. That means she gets up 3 days a week, has large needles jammed into her arms, all her blood removed, cleansed with chemicals and returned. She can't work. Travel, diet and lifestyle are deeply restricted. And she does it all without complaint. People who meet her do not begin to guess that she's anything but a 30-something young woman with a cheery attitude. Currently, she is on Medicare. Almost all people on dialysis, as I gather it, are also on Medicare thanks to being classified as something called "endstage renal failure". Ie: The Government recognizes that you are likely to die, and will die, without the government assisting with the cost (ie: doing what your insurance carrier won't or can't) to keep you alive. Medicare is often criticized and reviled as socialized medicine. That is not her only coverage. Medicare takes things to a certain point, but she also has coverage extended by my employer. I was almost not offered any coverage by my former employer for Jamie (but that was a deal breaker, so we negotiated). I note this as many smaller, Main Street USA companies, can only afford to offer limited coverage. Somewhere in the federal government, someone made a decision, again, not to burden insurance companies with the hundreds, if not thousands of dollars, that get wrapped up in each dialysis treatment. Somehow that all works itself out. Many of you may not know this, but in order to insure that the benefits will not disappear or change willy-nilly, I more or less have to work for a very large employer with excellent coverage to get the rest of Jamie's expenses (medicine, co-pays for visits, etc..) covered. And even then, that doesn't include the deductible. If you are genuinely concerned for corporations, you may wish to know, many companies aren't so much paying into an insurance collective, as much as covering your costs. They have a risk pool, that basically means they are covering your bills as part of their expenses. It's much easier for large companies and agencies to absorb than small companies. So smaller employers taking me on are taking on what they may not consider to be a good investment. I more or less have to disappear into, say, The State of Texas, and hope I'm not the one with the craziest story. There is no scenario in which Medicare hasn't been a part in many years, but I can only assume that were it not in existence, I'd be enough of a financial burden that companies would be looking to release me to reduce their costs. I absolutely freak out when I think of how things go wrong with insurers. And a few times they could have. Hospital financial folks have routinely tried to find ways to get Jamie bumped from having Medicare as her primary insurer, intentionally and otherwise. Jamie has spent work weeks on the phone with the insurance companies sorting her situations. One doctor started Jamie on a treatment that an insurer decided sounded a little "experimental" for their tastes, which, given that it had already started, would have wiped us out completely had a weeks-long letter-writing campaign not ensued (I was looking at our options for a legal annulment to see if that wouldn't help solidify our financial picture). Through all of this, Jamie has managed to have phenomenal doctors, paid in whole or part by Medicare. I think they probably do okay, financially. I should mention that her quality of treatment had everything to do with the quality of her doctor, which varied wildly, and who, I am sure, had no idea who was paying them. We know for a fact that Norway, Denmark, France, England, and many other perfectly healthy, educated countries get by just fine with socialized medicine. Pointing to the occasional Canadian who visits the US to expedite their treatment shouldn't really convince anyone the system is a failure, any more than Americans flying to India for cheap surgery indicates that's the only option. The Canadians are not dropping dead in the streets. And, hey America, take it as a challenge to sort out the the issues that you feel our European and Northern neighbors have not worked out. Does America believe that the Canadians or French have the last word on how this could work? I say boo to this lack of vision. Secondly, consider the sources who are telling you new policy will kill old people, that it will mean worse care (doctors are generally only spending about five minutes with each patient these days, anyway), etc... Before listening to that Rep or Senator, see how much they took from medical lobbyists in the past year. I'm not saying your local politician is a crook, but the lobbies don't just give away money because its fun. Thirdly, I understand that Medicare alone has not paid for the system we currently have. But it also isn't NOT helping fund our current system. Nor are you already not basically paying for collective medical care with insurance to begin with (it's just that someone is currently making a profit off you hedging your bets). The truth is, we don't really know what would happen to health care with a new system, except where we've seen it work with appropriate funding. Yes, there's potential for waste, but there's enormous waste in the current system (any hospital still using paper records should be shut down). No, there's no centralized database, which you're going to wish there was when you have a stroke in Cleveland and somebody wants your medical history before treating you. But those shouldn't be show-stoppers. Those should be problems we can look to be solved by a medley of private and public works. I issue this challenge: If the Pro-Life folks are truly Pro-Life, that shouldn't end with the usual issues. It's not enough to just insist that if you have to go on living, so does everybody else. Why does the philosophy not also suggest a certain responsibility to want to keep each other alive and healthy while they're here? Maybe giving up a little more to Uncle Sam to pay for this stuff is just putting your money where your mouth is. There is no doubt in mind that when someone becomes sick who you don't know, people (a) either put it out of mind as much as possible, and (b) occasionally try to find karmic/ magical reasons why that person became sick. Ie: I don't really believe we've ever shaken the superstitious belief that maybe when people get sick, maybe sorta fate/ God/ what-have-you, is sharing some message with the healthy? AKA: They deserve it, so how far out of my way should I go? Traveling outside the state again reminded me of exactly what an absolutely enormous country we live in. There are hundreds of millions of us. We have enormous potential and power in this population. If we willed it, we could see to it that kids could get insurance, that people who lost their jobs could get coverage/ health care, that people whose workplaces are cutting benefits left and right have an option. Call it "socialism", fine. It's a label as good as any. But it also doesn't immediately mean we're rolling over to work in Stalin's work camps. We might see a little less lucre in our pockets, and maybe we can't afford that box set of Dawson's Creek this month, but maybe it's a sign we're as worried about the next guy as we like to think we are. 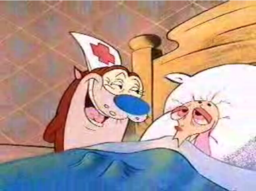 And I do not say this lightly as someone who wakes up and checks his wife for any sign of illness every morning. Like anything else, tomorrow you could wake up with FSGS. Or your spouse or children. And you're going to find out that (a) people don't really care, and (b) this could easily wipe you out completely, and when the money goes, so does the ability to keep someone alive. I consider myself incredibly lucky that the government had the foresight to put Medicare in place, which is socialized medicine by any measure. Your freedom of life will be limited enough. Your choice of employment will decrease in a way you can't begin to imagine as you start looking at benefits packages before salaries, career futures, etc... And you try very, very hard not to become one of those stories you see on the evening news about some middle-class family in Tennessee struggling to make it after one of them suddenly fell ill.
You'll note I've shut off the comments for this post. I don't do this often, but I'm doing it this time. I consider this an issue of life or death for Jamie. That's where it begins and ends. It is not an abstract discussion about whether Obama is trying to turn the whole country upside down as a damn, dirty liberal. Or whether you believe that the government can't do anything right. This is an actual issue that effects millions of people, being voted upon by government workers who get the rad benefits package that many people go to work for the government to obtain in lieu of salary. I wish you happiness and health for you and your families. May you never be in need of government subsidized medical care. May you never worry about how you'll pay the hospital bill, or worry that your insurer will drop you because you finally need them. May they never declare your life-saving treatment "too experimental". May the people processing your insurance information get your data inputted correctly, and the minimum wage person handling your claim not screw you so they can go to lunch early. Anyway, in addition to shutting down comments, I'm going on hiatus for a while. 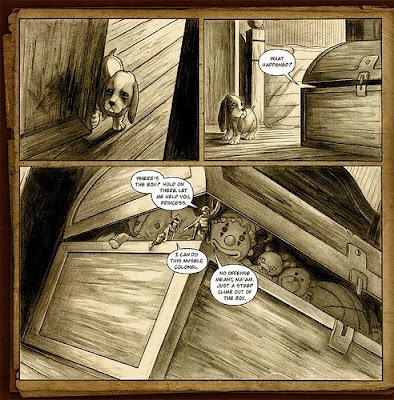 This is a non-political blog, and I don't feel comfortable having talked about any of this. 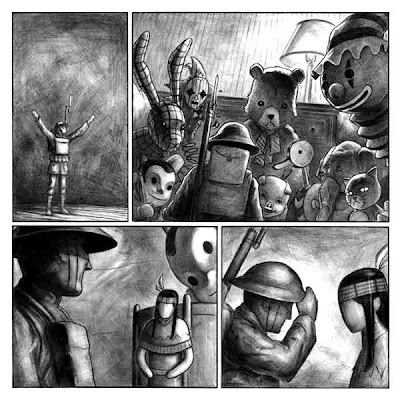 Seriously, I love "Toy Story". This is great news! I was going to say something about the characters I particularly like, but, heck... it's just that kind of movie that its not necessary. Superman: Cartoons, Commies, Movie Rumor Repeat, Conspiracy! In 1988, Ruby-Spears, who was responsible for a lot of the animation folks my age grew up on, put out a Superman cartoon. I've never had opportunity to see it except as clips on YouTube. It seems that either Austin didn't carry the show, or I wasn't rising early enough on Saturday to catch it. At any rate, the show didn't last long, and has largely been forgotten. WB's Home Video group must know that the Superman contingency will buy anything with the "S" on it, because they do, in fact, have a steady stream of these sorts of things that have been coming out of the vault since around '03. According to The Superman Homepage, the cartoon is getting its due and coming to Home Video in November. I'm 34 and have a mortgage, so its pretty obvious I should care a lot about this sort of thing, I would think. Anyway, yes, this thing will find its way into The League's official Superman Library. Here's the opening for the show. 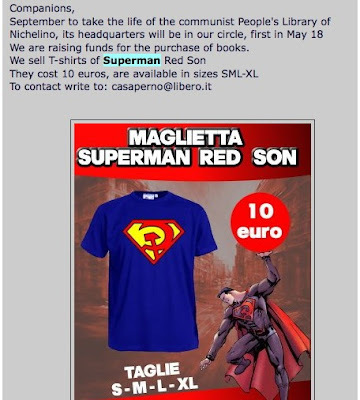 Apparently Italian Communists have stumbled across Mark Millar's re-telling of the Superman mythos, "Red Son", in which an infant Superman lands in a Stalinist Collective Farm instead of Kansas. Raised in that sort of parallel world of Russia we all learned about from movies like "Firefox" (which was awesome), Kal-El becomes a great Commie Benefactor to his Commie People, fighting off Capitalist Pigs like Lex Luthor (whose wife, Lois, carries a torch for the barrel chested bread-line-stander). In our actual world, having not learned that Communism failed or turned into N. Korea, the Italian Communist Party (again, this part is real, not a comic) has adopted the Hammer and Sickle Super-Emblem and artwork from the comic for their very own. Luckily, the commies are looking to make a buck off the shirts. I'd buy that for a lira! Much more on this here. It is clear the Commies are failing. They do not offer the shirt in the more prosperous sizes I would need to fit into one of their T's. So there's a rumor going around that the next Superman feature will be helmed by the Wachowski Bros., who lost Warner Bros. an untold fortune with the epic fail that was "Speed Racer". Here. What nobody seems to notice is that this is the same rumor from February. That was debunked back then. That hasn't kept the Super-nerds from totally freaking out. Superman of the Muslim Persuasion? I assure you, if you're a DC fan and don't buy into wing-nut conspiracy theories, this is hilarious. from our Canadian Friend, Simon. This is kind of funny and well animated. Found at Calvin's Canadian Cave of Cool. 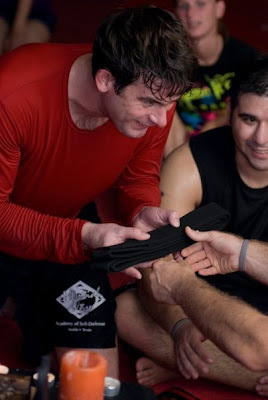 Leaguers, it is with great pride that I announce that League-Pal Matt Mangum has earned his Black Belt! 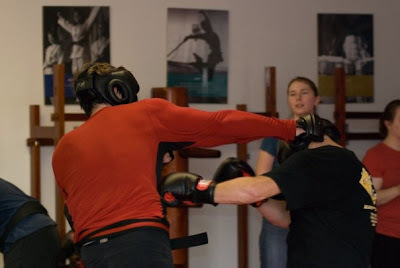 Matt's quest for the Black Belt has been going on several years, and culminated this weekend in a 3 day marathon session of kicking and punching things (ie: people). 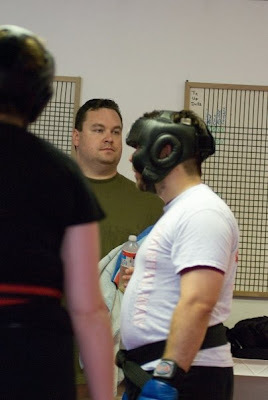 Jamie, Patrick and I joined Matt's lady-friend, League-Pal Nicole, to watch today's sparring and belt ceremony. Leaguers will know that I, myself, once mastered the ancient art of strip mall Tae Kwon Do, so I know a little about what Matt's been up to, although my program was nowhere near as intensive. The League will cop to the huge amount of respect we have for anyone who puts in the effort I've seen out of Matt and the work I saw today. But the unsung hero of the day was the erstwhile towel and water-boy who bravely stood by his pal, ready with a sip of H20, or ready to mop sweat from Matty's brow. 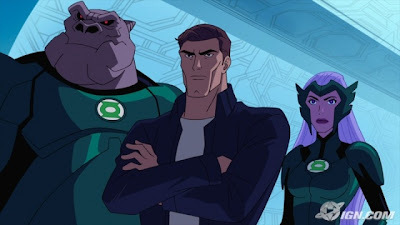 There's a lot of good in the new DCU Animated film, "Green Lantern: First Flight", but one can't really help but find it hard not to wish WB Animation would let these movies run another 20-30 minutes longer to flesh out the story. For this viewer and comic dork, the movies don't give enough time to allow for the details that (a) fans would appreciate, (b) are part of the character's appeal and charm, and (c) probably would help a bit with what feels like 20 pounds of plot crammed into a 5 pound bag. Its understandable during the first few forays into the format, but at some point, it seems like DCU Animated would take a step back and try to figure out how to improve upon their process. As a DC character with 50-odd years of history behind him, Hal Jordan, The Guardians, and the Green Lantern Corps are one of the more complete mythologies in the comics-verse. As a kid, I remember starting to uncover GL with Emerald Dawn and the GL series which followed (but which went off the tracks almost immediately as DC refused to let the series return to its conceit of Hal Jordan as one of 3600 space policemen). But the pieces were there. Hal, power batteries, Kilowog, a Guardian or two, and the rings... All kind of fascinating stuff. In high school I had a plastic GL ring that glowed in the dark, that I remember leaving in my window so it would always glow a bit at night. And in watching the film, while I feel they absolutely tried, and that they did a pretty darn good job of making a movie people might enjoy, it was pretty clear that the parties responsible were not GL fans. It's not that they don't like GL, its that they seem to have just not really soaked in GL long before making their movie. I'm not particularly wound up that after the canon (and required) transfer of the ring from Abin-Sur to Jordan that the team didn't stick to any known canon (be it Silver Age, Emerald Dawn I, or Johns' reinterpretation). But I do want to point out: There were no actual Lanterns in the Green Lantern movie. Not one. As near as I can tell, somebody decided that the actual Lanterns/ charging device which each individual Corps member is assigned with their ring, would mess up the story they were trying to tell, and so just omitted them for narrative expediency. Not since Alan Rickman uttered "I AM the Half-Blood Prince!" have I been so underwhelmed by how pre-existing material was handled. It's a single example, but I think a fairly telling one. 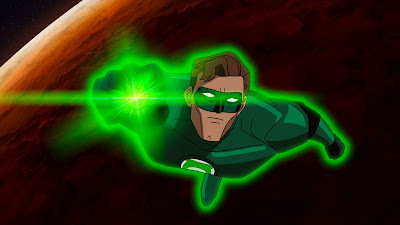 I do think it would have behooved the DCU Animation team to stick closer to Johns' reinterpretation of the GL mythos, as the cartoon feels dated even as one watches it, even with Sinestro in his Sinestro Corps togs instead of the classic Blue and Black. The plot basically fast forwards through Hal obtaining the ring and speeds past Carol Ferris and Ferris Air in order to cut to the chase, but once you're there, the plot (skewed as I may personally find it) is well executed. For those of you not weighed down by GL comic history, it's an engaging tale of a rookie on the learning curve. And maybe the story is a bit tighter than what I think of when I ponder a character like Sinestro or Ch'P. In many ways, its sort of "Training Day" by way of GL Corps, and that's somewhat accurate to the comics. It's a good tack to take, provides for a bit of intrigue, but GL fans will feel the tick of the clock hands and WB Animation's self-imposed time limits in cutting out any mention of Korugar and the realization of Sinestro's view of the world. That doesn't mean that it doesn't work in the movie, as Sinestro jumps from Corps Member to Antagonist, but the motivation doesn't stick quite as well. The animation is excellent. It relies on the work of our neighbors from across the Pacific from time-to-time, and often just goes ahead and looks like anime, but I think that's actually pretty great. Its 2009, and if you can't appreciate a little anime in your movie, well, more's the pity. The design work on the costumes completely worked for me, and 90% of the character design. I did NOT like the re-design on Kanjar-Ro, from sharkish freak to semi-generic squid/ bug aliens (but do not get me started on how much I liked the re-design of the Weaponers of Qward). But Ch'p, Kilowog, Arisia, etc... and the Guardians looked great. The pacing is dead on, the voice acting was very good, even if Kurtwood Smith as Kanjar-Ro was almost distracting in its Kurtwood Smith-ness. I do feel that Meloni was a good choice for Hal Jordan and that Victor Garber is an excellent choice for Sinestro. I appreciate the work director Lauren Montgomery pulled off with the movie, and I'd be curious to see what she'd do if time and money were available on a Pixar-like scale. She's working with enough constraints to befuddle Mister Miracle, and she's still able to produce work that's setting new standards for storytelling and animation in the long, tough history of super-hero animation. In the end, GL is often a comic-dorks' comic. 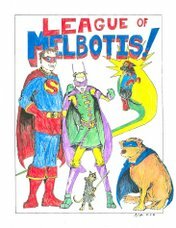 Like Superman, its full of obscurities that only readers and fans will know (I only know, roughly, 1/3rd of the Lanterns' names I could know). But for folks coming fresh to Green Lantern, its a sort space opera/ fantasy. If you're looking for science in the science fiction, you will be deeply disappointed. But if you're looking for space-faring, interplanetary adventure, I honestly think the movie works pretty well. Jason posted this video from Peter, Bjorn & John, and it got me thinking about Swedish rock I've enjoyed. I used to be into these guys in college. Not sure what happened to them. And, screw you guys. I like Abba.